Last September, Pat Spenner, co-author of The Challenger Customer and I presented a webcast entitled Lessons from the Challenger Marketing Trenches. 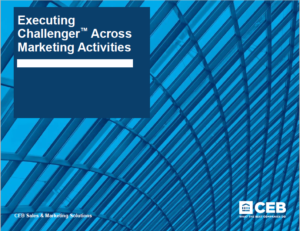 During the webcast Pat and I shared our key learnings on executing Challenger across a multitude of marketing activities: customer understanding, marketing messaging, content strategy development, content and sales tool production, and lead generation. On March 8th at 11 am (EST) Jessica Cash and I will be presenting Using B2B Content to Drive Alignment & Accountability, details on the event and registration below. Overview: With increased budgets comes increased calls for accountability. Today’s top marketers are using Commercial Insight, personal value, and help from peers to craft content strategies that result in more than just customer engagement. Learn best practices and ways to avoid common pitfalls that often leave marketers struggling to improve lead quality. How can marketers avoid always defining their business solely from the legacy perspective? How does redefining themselves allow for better alignment with customers? How can value drive customer action? Jessica and Scott will be holding up the mirror in order to show how CEB is applying these best practices and principles in their own marketing efforts, so come ready with questions! ‘Tis the season for Christmas catalogs. Tons of them roll into mailboxes across the country and, shortly thereafter, into recycling bins. In our house, two catalogs escape this fate but for different reasons. paign ever, and “Unbroken Ground” the best product launch campaign. I believe in the company’s causes, point of view on the world, anti-consumerism message – all of it! The catalogs are as much about adventure and causes as they are about the clothing. 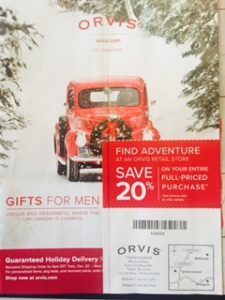 The other catalog that escapes the recycling bin, at least temporarily, is Orvis. Its prominently-displayed coupons on the cover have me at “hello.” “Free money” works for me – so much so, I’m conditioned to respond to a coupon that the last time I bought something without one I developed a rash. Yes, I know the discount is baked into the price, but it works. I peruse the catalog looking for an item to apply the discount as soon as the catalog arrives. So here’s the difference: while I spend more time reading the Patagonia catalog, I buy more from Orvis. In fact, despite my love for the brand, I don’t own any Patagonia clothing. In the business-to-business (B2B) world, I am what you would call a “false positive.” I’ll consume your content all day long but I won’t convert. And in today’s world of deep targeting and conversion-focused metrics, I might get missed. 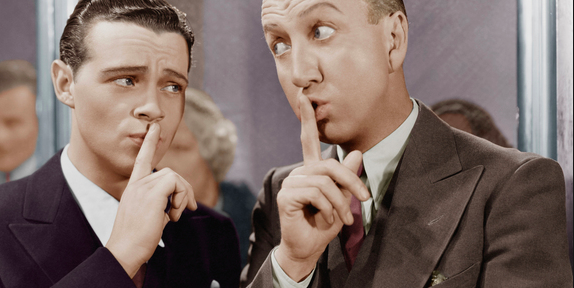 Brand advocates, like me, are incredibly important for B2B brands. In the book, “The Challenger Customer” by Brent Adamson and others, I would be described to as a “mobilizer.” Mobilizers advocate for brands with other decision makers within the decision-making team. In fact, the likelihood of a closed deal increases dramatically if you can find one to champion your brand. In our home, I’m the brand advocate and economic buyer and my son is the user. The reason I don’t buy Patagonia is that I believe their clothing is more of a fit for a teenager who refers to it as “Fratagonia.” I’m more the Orvis generation, but I alert my son to things I think he would like because, unlike me, he spends zero time looking at “old school” offline catalogs. This same pattern is repeated in the business-buying world. Brand advocates will spend hours reading your content, watching your videos, and attending your events. They’ll show up in Salesforce as leads but will never advance, causing frustration for sales reps and managers. So why shouldn’t we dismiss them? They’re also the ones who will recommend your brand to a colleague who is searching for a vendor to fit a need. The challenge has been identifying and targeting “mobilizers” as described by Adamson and his colleagues. After spending about a year trying to figure this out, we’ve discovered three “markers” that might help lead you to these mystical influencers. Consumption of long form content. In a world moving to shorter and shorter content, mobilizers will invest time with your content. They’ll spend the seven, or even twenty minutes, to view a video if it’s well done. And don’t take all of the long form content off the website just yet. These folks will consume and summarize key points for others. Pay special attention to time spent on the page, along with visitor viewing habits on heavier content pages. Repeat visits over a longer period of time. Buyers who are in the decision-making process have a tendency to “burst” visits. They’ll hit your site in rapid succession and consume a large quantity of content over a brief period of time. Brand advocates – like mobilizers – consume content more consistently over a longer period of time. Watch and track your repeat visitors, and see if they are also subscribing to your e-newsletter, attending webcasts, etc. You need to track and trend these visitors over the year (or even two). Sharing habits. Another trigger for tracking these influencers is the sharing of habits. They’ll share content they find to be meaningful. Take a look at consistent content sharers. Make sure you have them identified in your ABM programs. Build email campaigns with content links that are intended to travel, and watch where they land. Make sure you can aggregate all of the activity mentioned above against a single profile. You’ll need all the data to identify mobilizers. The other homework assignment is to take a hard look at your organization and ask if you have the type of content that would create and energize brand advocates. What does the organization stand for? What is its point of view, its purpose? If it’s “to sell something” or “to make money,” you don’t have it. #1 – You got lucky – if you generate leads off the first drop/wave of a new account acquisition or a lead generation campaign for a solution, you’re more likely to be lucky, than right. Yea, you may have had a compelling offer, and the call to action was intriguing, but the chances are, you just happened to hit a prospect at the right time. Sure, in some industries you can buy data that identifies a company’s spend on certain products or services. But you don’t know if the budget is available, what portion of it, or who controls it. And since this is a prospect, you are most likely targeting a title, which could be a decision maker, a budget holder, or just a curious information seeker. At the beginning of a campaign you simply don’t have the information on a prospect to know where they are, or how to advance them in the buying process. So, if a prospect does put their hand up and says, “Call me,” you most likely hit them at the right time in the buyers’ journey. #2 – Your messaging is weak – the effectiveness of your message is being compromised by the fact that you are trying to motivate an audience to think or feel differently without explaining why. According to Pat Spenner, co-author of the new book entitled The Challenger Customer, marketers spend too much time focusing on how they want audiences to think, or feel, without understanding their current mindset. Research for the book found that the receptiveness and/or openness to a message depends heavily on an audience’s existing belief system, which drives their behavior. According to Spenner, marketers first need to understand and break down the audience’s current mindset using insights about their business, customers, markets, etc. It’s an opportunity to “teach” audiences that their current thinking is no longer valid and why a new way of thinking is needed. If done well, the new mindset will uniquely lead them back to your product/services or brand. For example, Merck developed the cholesterol-lowering drug Mevacor at a time when doctors knew little about the effects of cholesterol on the body. The current mindset was that hypertension (high blood pressure) caused heart disease. Merck used clinical research to show doctors the impact of high levels of cholesterol on arteries and the correlation of plaque buildup with coronary heart disease (the “teaching” moment). #3 – You’re doing lead nurturing the wrong way – changing mindsets takes time. Yes, you’ve built prospect profiles, aligned content to their interest, and you may even know how to engage them in their preferred communication channel. The problem may not be your content marketing efforts but the fact that prospects are stuck in the status quo. They may find your information interesting, but it hasn’t convinced or motivated them to change their behavior. Nurturing efforts should continue to break down, or build up, the new mindset across the buying group. The ability to drive specific information aligned to individual buyer’s needs may actually be causing more dysfunction within an already dysfunctional group. To advance a prospect/s refocus efforts on driving consensus on the issue and solution within the buying group. If done correctly, like Merck, prospects will come to own conclusions that you offer the best solution for their needs. Motivating an audience to change doesn’t happen overnight. Unfortunately, marketers are under constant pressure to perform and rarely have the luxury of time to change their approach. It’s the reason I shared the first dirty secret, to buy marketers time to create the type of campaigns that deliver insights told as a story revealed over time. The first wave of your campaign will generate leads, but it’s the waves that come after that really count. If marketers can stop telling customers why they need their product and let them come to that conclusion on their own, response and conversion rates will double based on my experience. But don’t tell anyone, it’s a secret. My first job out of college was selling office equipment. 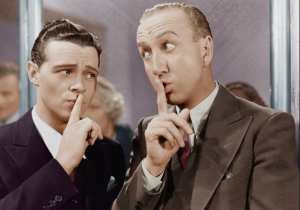 The first thing I ever learned about selling (from my very Southern sales manger) was that “Telling ain’t selling.” In layman terms, stop telling customers why they need your product and start listening to their needs. For years this simple phase remained in my memory. It guided me as a way to engage prospects in advisory-like sales dialogue, probing for a need to sell to. 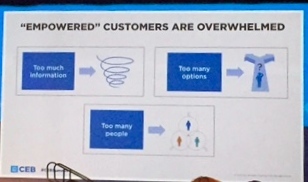 But, after attending CEB’s Sales & Marketing Summit last week, where new research highlighted the increased complexity in reaching a purchase decision, I’m now considering rethinking my whole approach. Why? Because buyers have become overwhelmed by the potential choices, and the involvement of other decision makers in the process, according to Brent Adamson, co-author of The Challenger Customer. Too much information, too many options and too many people involved in the process are making it more difficult than ever to reach a consensus, let alone a purchase decision. Given the complexity, stalled deals are no longer a sales issue; they’re a buying problem. The question is: Are marketers contributing to that problem? Is it possible our content marketing efforts, aimed at helping buyers make an informed choice, are becoming part of the “too much” problem? According to Psychologist Barry Schwartz, author of The Paradox of Choice, too much choice often results in no choice at all. Be the “expert” or “simplifier.” Help reduce the complexity of the problem, process and/or solution. Smart content should help to explain and simplify solutions to complex problems. Understand the impact of “no decision.” If no decision is the right decision, then find a way to make it the default answer. This approach is commonly seen in software or subscription-based services where membership/licensing automatically renews. Do we now dictate to customers/prospects? Not according to Schwartz. Asking probing questions that lead customers to convince themselves that they need your product is the path to goal attainment. Help them understand how your product/service uniquely solves their problem by guiding their path to purchase. Posted on October 29, 2015 October 30, 2015 Categories 2015Tags b2b, b2b marketing, Brent Adamson, CEB, Dr. Barry Schwartz, sales, selling, The Challenger Customer, The Paradox of ChoiceLeave a comment on Telling is Selling? Just when we’ve convinced the organization that the key to our marketing communication success is personalized content, new research from CEB highlights that we actually may be doing more harm than good. The years spent improving our understanding of the buyers journey, the development of more insightful personas and content, may have resulted in marketers ability to be too good at personalizing solutions to buyers. How can that be? The issue, according to CEB’s research underpinning their new book The Challenger Customer, is that our improved ability to increase a buyer’s awareness of those areas of a solution most relevant to them, has inadvertently increased visibility into the overall risks associated with the purchase decision and/or change. As a result, buyers begin to unbundle and simplify solutions, driving down price points. The shocker of this insight is that marketers improved ability to personalize content may be coming at a cost to sales. According to co-author, Pat Spenner, the real challenge lies in convincing buyers to first agree on making a change. “Focus your content marketing efforts on creating a consensus case for change among the decision making group,” which according to CEB’s research, now involves at least five people in the typical B2B purchase. So should we stop personalizing our communication? No, but it does highlight the need to also create that common rallying point, and to equip key buying group stakeholders with the tools to create consensus around it. Something the authors say helps clients elevate the conversation from “me to we,” an umbrella approach that ties your content efforts together regardless of the audience being targeted. To motivate buyers to change you first have to disrupt their status quo by planting and nourishing seeds of doubt about “business as usual.” Show them not just the benefits of action, but the consequences of inaction. CEB recommends using fact-based content built off a Commercial Insight to break down buyers existing mental models. Concurrent with breaking down the audience’s long held beliefs, you need to give them something to aspire to — a new future state that rallies the group to take action. This is where a compelling creative campaign does the heavy lifting. 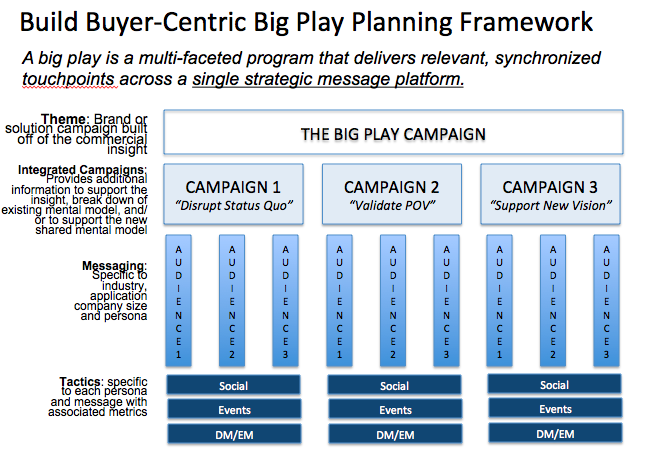 A “big play” campaign, like IBM’s “Smarter Planet” creates a compelling future vision but also provides a broad platform to disrupt IBM’s many different buyers and to cover IBM’s expansive solution/product portfolio. The key to leveraging the good work marketers have done to increase relevancy with buyers? Properly balance and/or convince the audiences that the rewards associated with making the change, both organizationally and personally, outweigh the risks you’re asking them to take on. If not, they will reduce the risk for you, and you may be hearing about it from sales.